RICE FLOUR, CALCIUM CARBONATE, AND LESS THAN 2% OF: SOY LECITHIN, TUNA OIL (SOURCE OF DHA), POTASSIUM PHOSPHATE, FISH GELATIN (TILAPIA), B Lactis Cultures, ASCORBIC ACID (VITAMIN C), ELECTROLYTIC IRON, ZINC SULFATE, ALPHA TOCOPHERYL ACETATE (VITAMIN E), NIACINAMIDE (A B VITAMIN), RIBOFLAVIN (VITAMIN B2), THIAMIN MONONITRATE (VITAMIN B1), PYRIDOXINE HYDROCHLORIDE (VITAMIN B6), VITAMIN B12, FOLIC ACID (A B VITAMIN). This is the ingredients of rice cereal taken straight off of the Gerber website. In my quest to find research based advice on the subject of all things parenting, I am on a mission to read labels. You will notice that this “rice” cereal l actually doesn’t contain rice, but rice FLOUR. Way back when I started my college career, I took a nutrition class. There I learned that on food labels, the first ingredient listed is what makes up the majority of the product. Most consumers don’t realize this. So when you feed rice cereal, you are feeding your baby some flour with a bunch of additives, or fillers. It’s nutritionally void. Better options are available. Additionally, rice cereal is linked to a higher risk of diabetes. The reason that this occurs is because the body needs pancreatic amylase to break down grains. Babies do not produce amylase fully until around 18-24 months, and when they are fed rice cereal before that time, it causes a spike in blood sugar levels, which can lead to pancreatic failure & diabetes later in life. 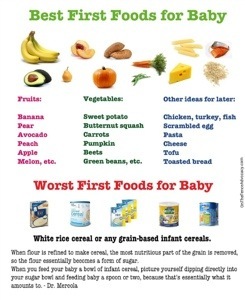 Since babies cannot digest rice cereal, it sits in their gut and rots. This can lead to digestive problems, immediate and long term, and can lead to a very unhappy baby, despite the nay-sayers who claim that “their babies ate it and turned out just fine”….just please don’t even get me started on THAT argument! Babies’ guts only contain one carbohydrate enzyme: lactase. This is biological proof that babies only need breast milk until they are at least a year old. So if we’re not feeding rice cereal, what foods should we start with? A recent article in the New York Times http://www.nytimes.com/2013/03/25/health/many-babies-fed-solid-food-too-soon-cdc-finds.html?_r=0 suggests that some moms give their babies food too early to help them to sleep, however, this can be a dangerous practice. Adding rice cereal to a bottle is outright dangerous. Not only is it a choking hazard, but when babies are manipulated into sleeping longer, it greatly increases the chance of SIDS.